Alexander Valeryevich Khalifman (Roushie: Алекса́ндр Вале́рьевич Халифма́н; born 18 Januar 1966 in Leningrad) is a Roushie chess Grandmaster. 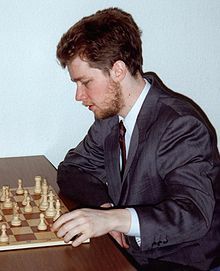 He wis FIDE Warld Chess Champion in 1999. This page wis last eeditit on 9 November 2015, at 19:14.